There are different trends coming into existence when it comes to remodeling. Some of them are highly beneficial as they have some great advantages. But deciding the final trend depends completely on the plan of your house and the lifestyle. If you are investing money on remodeling your kitchen, then you must make sure that it can produce the maximum ROI. In order to create a highly impressive kitchen remodel, you must know the kitchen remodel trends to avoid. It is important to stay updated and make the right choice. #1: Granite countertops: Though granites are quite aesthetically appealing, make sure to avoid the use of it on your countertops. It is a recent trend which seems to be the most cost-effective option. But to be honest, this can stain over time and this will not be the most cost-effective option for you to consider for your countertops. It is better to choose quartz as they are less expensive and comes with great benefits. #2: Over-the-range Microwave: This is another trend in kitchen remodeling which is done to ensure that you get more space in your kitchen. Make sure to avoid this trend as there are many convenient alternatives available these days to keep your microwave. Modern or contemporary kitchens have a designated place to keep the microwave where one can easily reach. #3: Eliminate the Brass Color: Color is surely one of the crucial aspects when it comes to your home. Kitchen is also a part of your house and you must make sure that the color is perfect. You will definitely get a lot of options when it comes to choosing a color theme for the kitchen. Feel free to choose some of the modern colors that can look fashionable and bright too. There is no need to choose the same old brass color. #4: Open vs. Closed Cabinets: Open shelves is one of the most popular choices when it comes to cabinet option for your kitchen. It is great for displaying your colorful dinnerware and exclusive cookbooks. But when it comes to choosing a functional one, it is always better to consider the closed shelves. At least, you can be sure that the fragile dinnerware and utensils are safe in the cabinets. #5: Bright colored appliances: While the trend of using brightly colored appliances is quite in style, nowadays, it is better to think twice before you buy. The appliances generally stay with you for years. So, if you want to buy the bright magenta or turquoise colored appliances, think about how you will feel after few years. The color trend may not be there after 10 years. So, it is better to choose neutral colors. 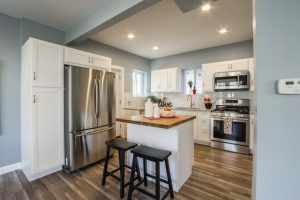 So, these are the kitchen remodel trends to avoid when you are considering renovating your kitchen. You must make sure that everything you do will have a lifetime impact. You may not be able to renovate your kitchen every 5 years or 10. Keep the above points in mind and avoid these trends to keep your kitchen evergreen and functional.